HomeCOMMENTARYHacked Emails… UNITED ARAB EMIRATES…Close Relationship with D.C. THE UNITED ARAB EMIRATES has one of the most repressive governments in the world. The Gulf dictatorship brutally cracks down on internal dissent and enables abusive conditions for its massive migrant labor force. It also plays a key role in the bloody war in Yemen, running a network of torture prisons in the “liberated” parts of the country. That makes it all the more shocking that the UAE is so rarely criticized by leading U.S. think tanks, who not only ignore the Gulf dictatorship’s repression, but give a privileged platform to its ambassador, Yousef Al-Otaiba. [pictured right] Otaiba is a deeply influential voice in U.S. foreign policy circles, and is known in Washington for using his pocketbook to recruit allies. The latest batch of hacked emails passed to The Intercept and other outlets by “GlobalLeaks” provide insight into how Otaiba manages to find — or buy — so many friends in D.C. think tanks. The documents offer a glimpse into how a small, oil-rich monarchy can obtain such an outsized influence on U.S. foreign policy, showing the ambassador obtaining favors from Obama administration veterans — including Hillary Clinton’s presumptive Defense Secretary — and making large payments in return. 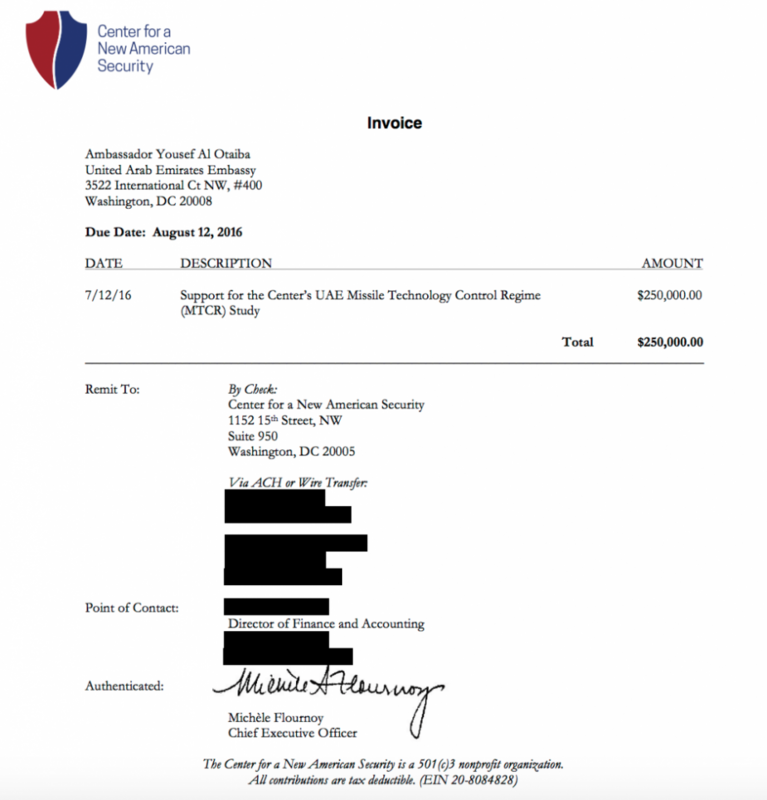 One of the documents obtained by The Intercept was an invoice from the Center for New American Security, an influential national security think tank founded in 2007 by alumni from the Clinton administration. The invoice, dated July 12, 2016, billed the UAE embassy $250,000 for a paper on the legal regime governing the export of military-grade drones. It was signed by Michele Flournoy, a senior Pentagon official under President Barack Obama; Hillary Clinton was widely expected to name Flournoy as her secretary of defense. Flournoy co-founded CNAS and, in addition to outside work as a management consultant, currently serves as the think tank’s CEO. Think tanks are independent institutions, but they are often funded by weapons companies, Wall Street banks, and even foreign governments. CNAS is transparent about the fact they have received money from the UAE, and even list the country’s embassy on website as a donor. These institutions, including CNAS, often assert that their scholars are independent of their donors, and that their analysis reflects their personal believes, not the interest of powerful donors. The invoice, however, as well as emails obtained by The Intercept, portray a different picture: a close relationship between CNAS and Otaiba, with Otaiba paying for specific papers and discussing the views in the papers with the authors. Otaiba later explained to those responsible for creating the policy papers how the documents would be used to push the UAE’s drone program. In its description field, the invoice reports that the payment was made for “Support for the Center’s Missile Technology Control Regime (MCTR) Study.” The MCTR refers to a 35-nation agreement that governs the export of certain large military-grade weapons. Countries can apply for membership in the MCTR and become eligible to buy these weapons. The MTCR has been aheadache for the drone industry because some of its products are classified as missiles, which makes them more difficult to export. The agreement has also irritated U.S. allies, who would love to get their hands on sophisticated, American attack drones. The UAE is one of the countries that ran into a roadblock in the MTCR. The Obama administration blocked the sales of some weapon systems to the Emirates because the MTCR prohibits their sale beyond close allies. Some lawmakers have pushed the Trump administration to allow for the sales. Goldenberg is an Obama administration veteran who led the Office of the Under-Secretary of Defense for Policy’s work on Iran. He currently serves as a senior fellow at CNAS. In June, CNAS produced a public paper echoing the same conclusions, arguing that the United States’s “reluctance to transfer U.S. drones harms U.S. interests in tangible ways.” Namely, the public report asserted that some countries are now turning to China to get the technology instead. The Emirates is listed as one of those countries that has been denied some drone sales, and has instead turned to China. The stated goal of the paper was to push the Trump administration on the policy. Urwitz also pointed out that CNAS is upfront in disclosing that it has received money from the UAE, both on its website and even in its experts’ congressional testimony. Additionally, according to Urwitz, CNAS did not take any money from the UAE prior to 2016. In another series of emails dated between February and March 2013, Flournoy uses a private gmail account to contact Otaiba and ask him to help promote the sale of electronic surveillance technology from a U.S.-based firm to the UAE. The UAE government is a voracious consumer of surveillance technology, and has repeatedly bought up electronic spying tools from Western countries to spy on political dissidents. In October, The Intercept reported that the UAE is recruiting a small army of Western hackers, who are helping to turn the Emirates into the world’s most sophisticated surveillance state. In a February 2013 email to Otaiba, Flournoy expresses dismay that du, a major Emirati telecom company, chose not to purchase location-based services technology from Polaris Wireless, a company that specializes tracking electronic devices. On its website, Polaris advertises “wireless location intelligence” that can be used in “locating and tracking known suspects,” “detecting and monitoring crowds,” and allowing users to “stay ahead of those who pose a threat.” Polaris Wireless has an office in Dubai. In 2012 its CEO credited sales in the region with a growth in revenue. 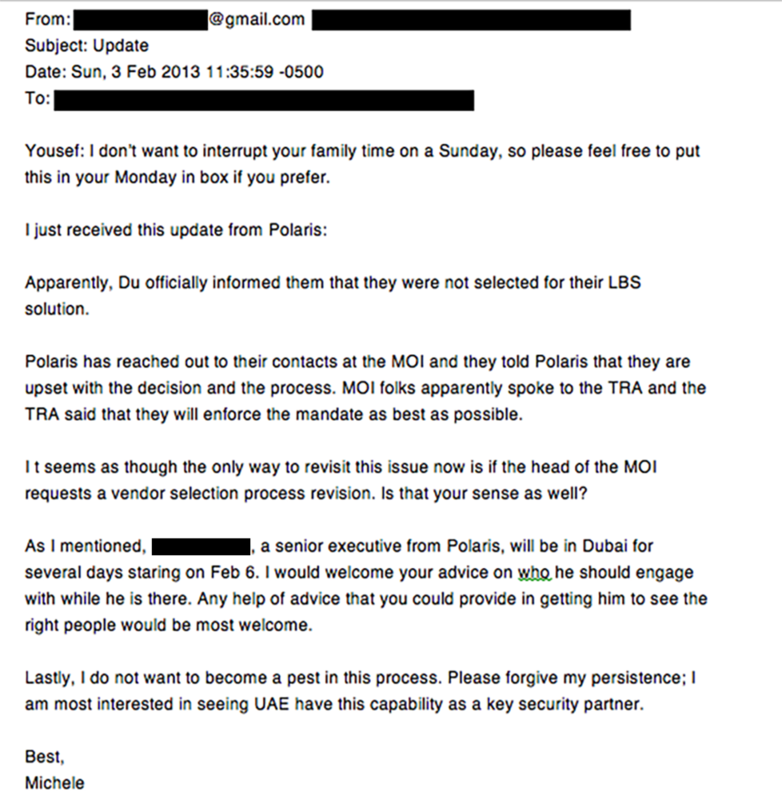 Flournoy told Otaiba that she is “most interested in seeing the UAE have this capability as a key security partner.” She asked him to intervene with the ministry of interior and help set up a meeting for a senior executive with Polaris. Urwitz, the CNAS spokesperson, did not deny that Flournoy’s conversations promoting Polaris took place, but said that they were unrelated to her work at CNAS. Polaris did not respond to requests for comment from The Intercept. “Michele Flournoy has known H.E. 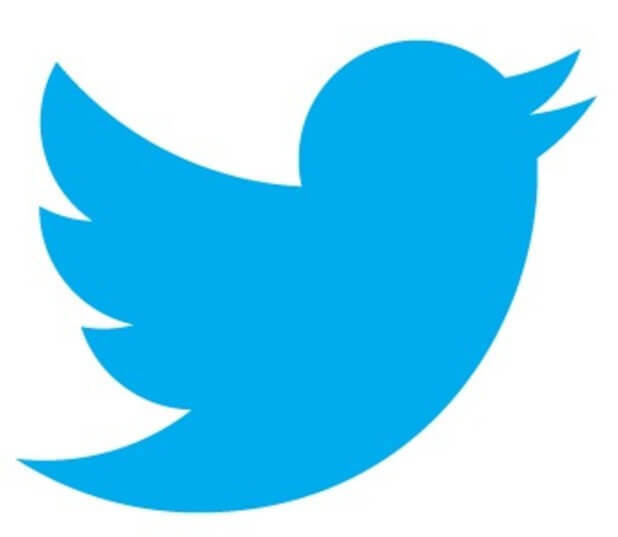 Yousef Al-Otaiba for years, both in and out of government,” Urwitz said in a statement. “The conversation concerning UAE security capabilities occurred while she was working in the private sector, not at CNAS.” While on the board of directors at CNAS, Flournoy has also worked as a senior adviser to the Boston Consulting Group, specializing in “public sector” and “security and defense” consulting work. The Intercept obtained correspondence between her and Otaiba from her email address with the consulting group, but is choosing not to publish it because it is not newsworthy. 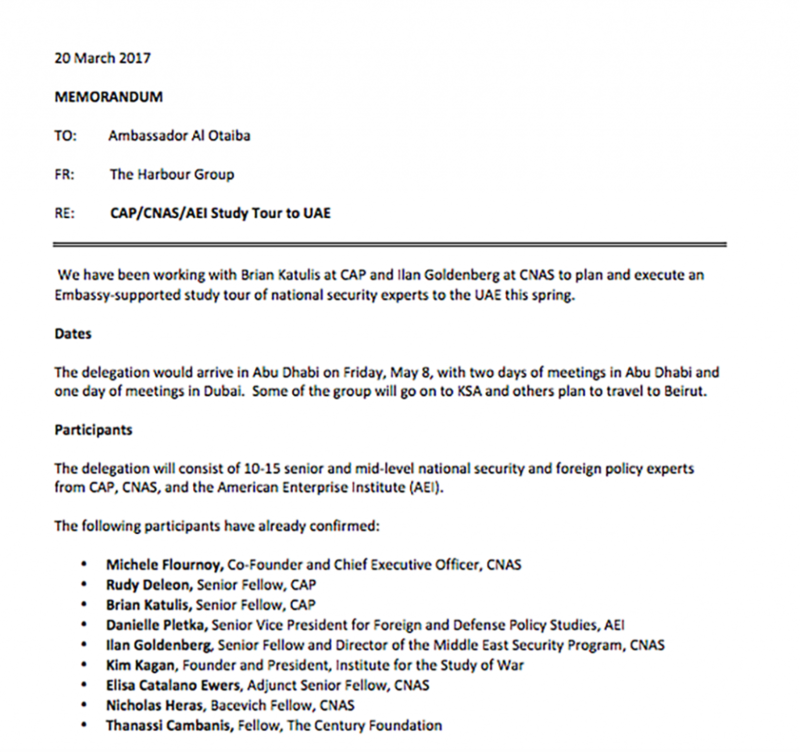 In March, the Harbour Group, a D.C.-based of public relations firm registered to work with the Emirates, sent a memo to Otaiba outlining the details of a sponsored trip to the UAE for a wide set of leading think tank researchers. Katulis and Goldenberg are cited as the organizers of the trip; other confirmed attendees included Kim Kagan, a top hawk at the Institute for Study of War, and Daniel Pletka of the neoconservative American Enterprise Institute, an influential Republican-aligned think tank. Additional attendees invited but not confirmed included CNAS president John Fontaine and John Podesta, the founder of the Center for American Progress and former chief of staff to Presidents Bill Clinton and Barack Obama. The memo laid out an agenda for the trip. “In addition to senior UAE national security and FP officials, we propose to expose the group to some new elements which may include the national service program; the space program; and a glimpse of the cultural scene in the country,” it said. One of the officials who was scheduled to meet the group was Mohammed bin Zayed Al Nahyan, the crown prince of Abu Dhabi and deputy supreme commander of the UAE armed forces. No dissidents, activists, or human rights lawyers were listed among participants in the meetings. Financing for the trip was apparently subsidized by the UAE, according to the memo. “The Embassy will cover business class fares for the group estimated at US$150K. We will request that CPC cover hotels, meals and local transportation.” CPC refers to the Crown Prince Court, a government-backed entity in the UAE. Neither the Center for American Progress nor the UAE embassy in Washington responded to requests for comment about the revelations of the emails and documents. Following the May trip this year, Katulis wrote to Richard Mintz of the Harbour Group to offer his congratulations for helping organize it. “Thank you again to you and your team. Your team has done a great job out here, as usual,” he wrote.